Giant Stacking Trays provide economical flat storage for the studio, home, office, or classroom. Create a durable and efficient flat filing system at a fraction of the cost of other products. Trays can be stacked up to 5 feet high and have a hefty, 40 lb (18 kg) per tray load capacity. Inside dimensions are 2" H × 42-1/2" W 32-1/2" D, big enough to accommodate most prints, drawings, papers, etc. Materials are always visible and accessible. Trays are made of heavy-duty, steel-reinforced polyethylene, so they will last for years to come. 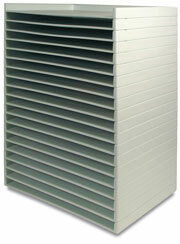 Use them alone or with existing filing systems for extra storage space. Trays are sold by the carton — each carton contains 2 trays. Small Stacking Trays — A smaller version of the Giant Stacking Trays, Small Stacking Trays measure 39" wide × 26" deep × 3" high. Inside dimensions are 36-3/8" wide × 24-1/4" deep × 2" high. Sold in cartons of 2 trays. To view a PDF of the Warranty for the Safco Giant Stacking Trays, please click here.